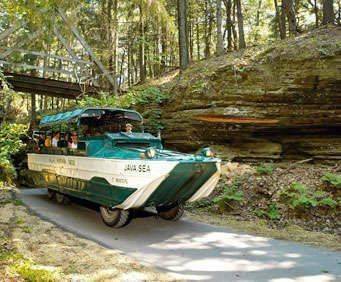 On the Wisconsin Ducks Sightseeing Cruise, you’ll travel over eight and a half miles of the Dells’ land and water in your amphibious vehicle. The Wisconsin River is one of the sights you’ll see with its Native American history. The one-hour tour also splashes down into Lake Delton, creeps through narrow shady gorges, and climbs the winding trails unveiling beautiful vistas for passengers. During the Zip Line Eco Tour, guests will experience about a 25-minute scenic hike to the summit of Chimney Rock Park where the zip line tour begins. During the Eco Tour, your expert guide will talk you through the technical basics before you start soaring through the trees of Friendship Lake Canyon and Aspen Grove. You’ll also be privy to the unique history of Chimney Rock Park as well as see some unique wildlife. The highlight of the tour, though, is Sunset Cliff where you can see nearly 100 miles out. This is one of the most thrilling ways to experience nature! The Wisconsin Dells area is known for its beautiful scenic landscape, and you will have plenty of time to take in the gorgeous views during your vacation. After soaking up the breathtaking views, rest easy at your choice from over 30 hotels in the area. Whether you’re looking for something budget friendly or something luxurious to set the tone of your stay, there is sure to be something that suits your needs with the Wisconsin Dells Vacation.